Impressively directed and superbly written, this is a powerfully suspenseful, genuinely chilling crime drama with terrific performances from Ben Mendelsohn and Jacki Weaver. 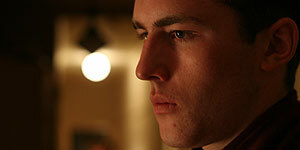 Written and directed by David Michod, Animal Kingdom is (very) loosely based on real-life Melbourne criminals and stars James Frecheville as 17-year-old Josh, who goes to live with his estranged grandmother Janine 'Smurf' Cody (Jackie Weaver) and his three reprobate uncles - Andrew, aka 'Pope' (Ben Mendolsohn), Craig (Sullivan Stapleton) and Darren (Luke Ford) – after his mother dies of an overdose. It quickly transpires that his uncles are part of a criminal gang and are under constant surveillance by dogged Detective Leckie (Guy Pearce), who warns Josh not to get involved. However, Craig and Darren repeatedly urge Josh to prove he's got what it takes and he's soon tricked into implicating himself in a serious crime. Meanwhile, a combination of Pope's return, Darren's drug-related activities and the shooting of a close associate (Joel Edgerton as Baz) causes escalating tensions within the family and Josh quickly realises that he'll have to adapt if he's going to survive. The performances are excellent, particularly Ben Mendolsohn, who's genuinely chilling as the psychotic Pope, and a deservedly Oscar-nominated Jacki Weaver, who may or may not have modelled her performance on Peggy Mitchell. There's also strong support from Pearce, Stapleton and Ford, while Frecheville gives an intriguing performance at the centre of the film that initially seems blank-faced and subdued but ultimately reveals hidden depths. Michod's superbly written script bristles with snappy, piss-taking dialogue that's often darkly funny, creating a believable family environment that's thick with underlying tension because you correctly sense that one dig too many will result in explosive violence. The film is also impressively shot, with striking cinematography by Adam Arkapaw. The violent scenes are well handled and Michod orchestrates some powerfully suspenseful, genuinely horrifying sequences that it would be churlish to reveal here. Animal Kingdom is a superbly written, brilliantly acted and genuinely chilling crime drama that marks writer-director David Michod out as a talent to watch. Highly recommended.